A soldier's day was dictated by the dreaded bugler, and some reenactments are fortunate enough to have a musician who assumes this role. 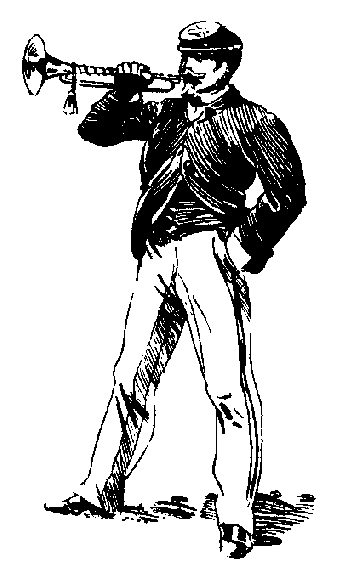 Click on the bugler for some of the bugle calls that an artillerist would hear. Assembly of the Buglers if in garrison. It was sounded at break of day, the exact time at the commander's discretion. Known as "First Call," it precedes a sequence of calls leading to a group activity, so would be the first in a series of calls. Signal for companies to form on the company streets. Signal for work details such as water, wood, etc. Signal for companies to march from the company streets to the parade ground for ceremonies. Afternoon roll call. Preceded by Assembly of the Buglers. Evening roll call. Preceded by Assembly of the Buglers. Extinguish lights. This is appropriate only for a period after 1862.